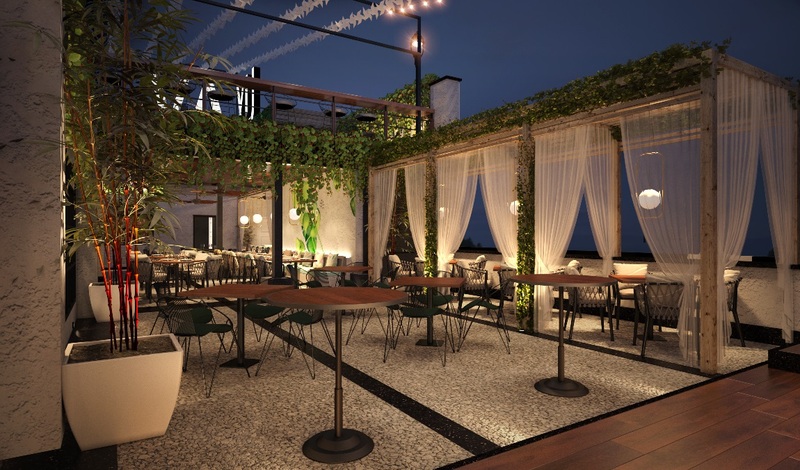 Located in one of the most alive and happening sectors of Gurugram, this gorgeous place is a café, bar and has a romantic deck all at one place. With a breath-taking ambiance to drool-worthy food, Duty-Free Bar has the most unique ‘pauwa’ drinks you can find nowhere else. 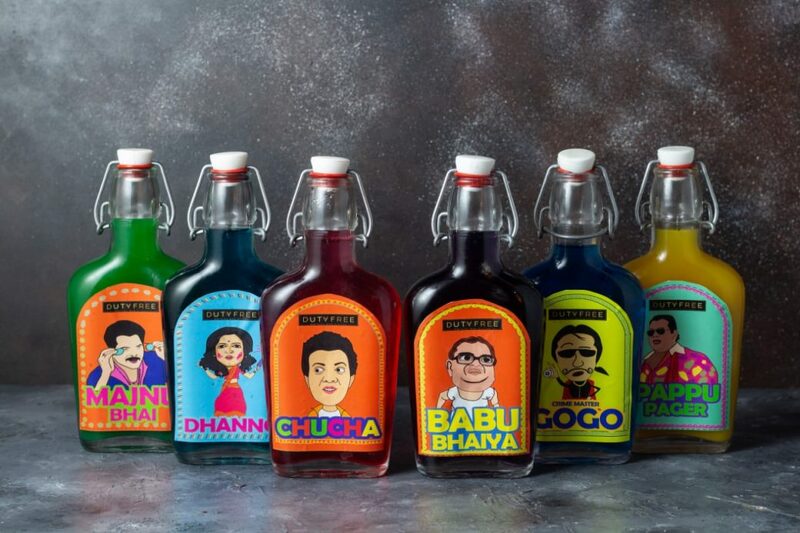 Inspired by the Bollywood comic characters, these glass bottles are quirky and fun! The property is a beautifully decorated building with four floors. The first floor is the party destination for the coolest people in town, but the open deck accompanied by their terrace bar is easily the best pick for a perfect romantic date. Expect an experience which is easy on your pocket and a drinks menu to please the Bollywood lover in you. Apart from the delicious food, Duty-Free Vayu Bar has come up with a unique ‘Pauwa’ menu. 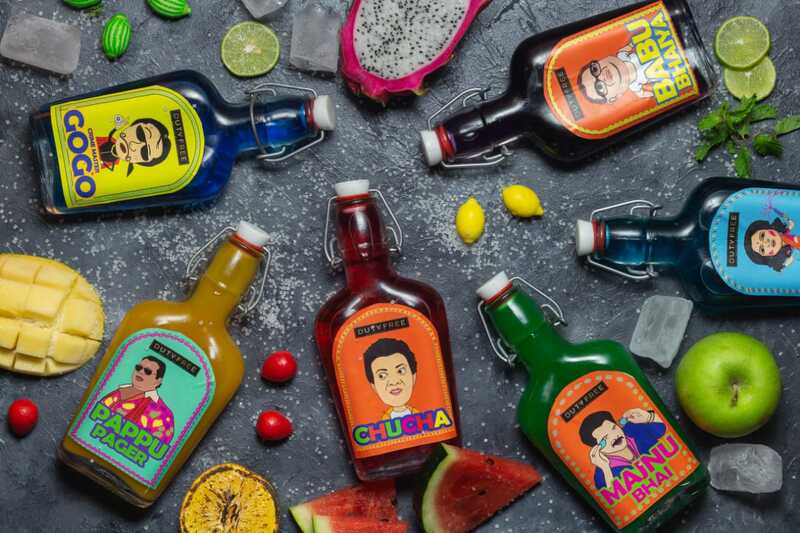 It’s all about quirky labels, Bollywood nostalgia and incredible taste all packed in one pauwa bottle. Infusing flavors of the classic movies, Duty-Free has designed bottles that suit each character. From Babu Bhaiya to Majnu Bhai, pick your comic favorite, taste them, guess what it’s made of and put down that glass of your regular drink! It’s time you color yourself in the colors of Bollywood and try something new for once! If you are someone who loves Bollywood and bored of plain- simple drinks menu then this is the right place for you! Big Wedding Up? Here’s A List Of Affordable Designer Stores No One Told You Existed In Delhi.